Jarius Andrew Greaves is working to bring Liberian youth opportunities through technology innovation. Participating in the IVLP has taken my work in Liberia to a new, more significant level. The experience gained and the network established have added value to what I do. I have been more daring than I was prior to participating in IVLP, and the hands-on experiences I had and the individuals with whom I met which have inspired and motivated me to strive for the best. I gained a greater awareness of the need for consistency, commitment and hard work to bring about change. Since my IVLP, I have successfully coordinated and implemented the “Liberia First High School Entrepreneurship” Competition, which brought together 40 high school students from 10 high schools. Formed into 20 teams and paired with 20 mentors, the students developed 18 sustainable business solutions, for which YONER hosted a Final Competition as the capstone event and selected three winners. The 1st Place team was invited to the United States to participate in the Global Semi-Finalist Competition at the University of Delaware. Jarius was selected to be a part of the first cohort of the Obama Foundation Leaders: Africa Program. Another initiative that is directly linked to my IVLP experience is the establishment and implementation of the U.S. Department of State’s Global Innovation through Science and Technology (GIST) Innovation Hub in Liberia. This is a one-year Project, an offshoot of a permanent partnership with the of US Department of State’s Office for GIST Initiative in January 2018 to establish the GIST Innovation Hub in Liberia. This is the second hub in West African Region, and the fourth on the Continent of Africa. 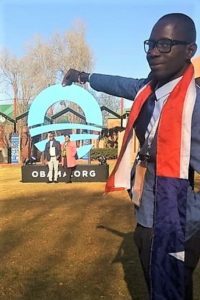 Finally, my IVLP experience helped facilitate my application to the President Obama Foundation: Africa Leaders Program, and I emerged as one of the 200 innovative young African leaders selected out of a pool of over 10,000 applicants from across the continent who will meet with President Obama to begin a conversation about creating positive change in Africa. My IVLP experience inspired me to envision local community residents working together to identify and solve their own problems. The IVLP also taught me that states handle their own affairs with oversight from the federal government, while local economies heavily rely on entrepreneurship activities that play a major role in determining the economics of each state. Finally, I learned how children and young people are striving to help their community using their own innovative ideas. Overall, I experienced young people focused more on doing business or creating something for the betterment of their community rather than joining local and national politics as is common in Liberia. I want to extend my thanks and appreciation to all the stakeholders who made my first trip to the United States of America a success. I learned a lot from the over 45 meetings held with entrepreneurship and technology innovation institutions in the five states we visited. I was inspired and motivated by the experts we met, and their initiatives have served as models for me to improve my entrepreneurship program in Liberia. I hope to be in touch with individuals who shared their knowledge and experiences with us. I have organized meet-ups and shared with colleagues the most important lessons learned during my visit to the U.S.
POST TAGS: Africa, Entrepreneurship, International Visitors, IVLP, Liberia, Meridian Alumni, Meridian Impact, Professional Exchange, U.S. Department of State.